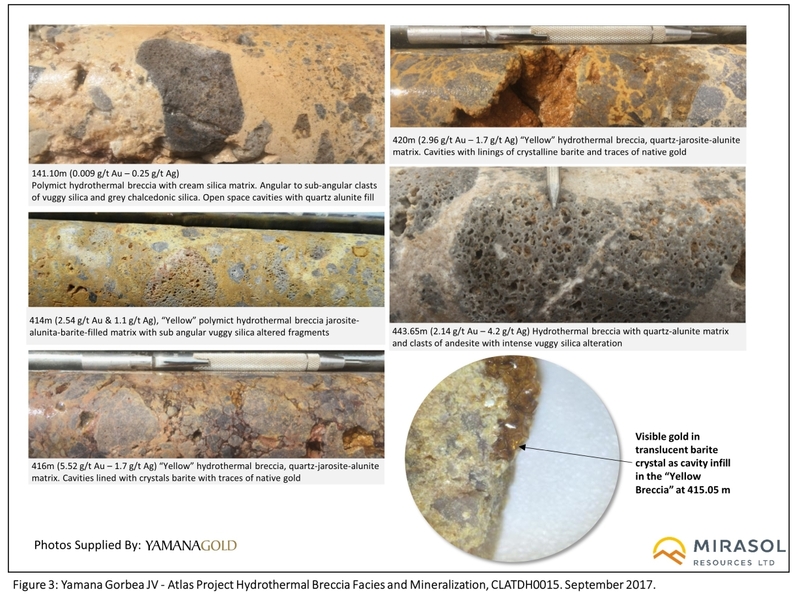 VANCOUVER, BC – September 11, 2017 — Mirasol Resources Ltd. (TSX-V: MRZ, OTCPK: MRZLF “Mirasol”, “The Company”) is pleased to report results from the second season of drilling by Yamana Gold at the Atlas Project, Gorbea JV in the Mio-Pliocene Belt of Northern Chile. 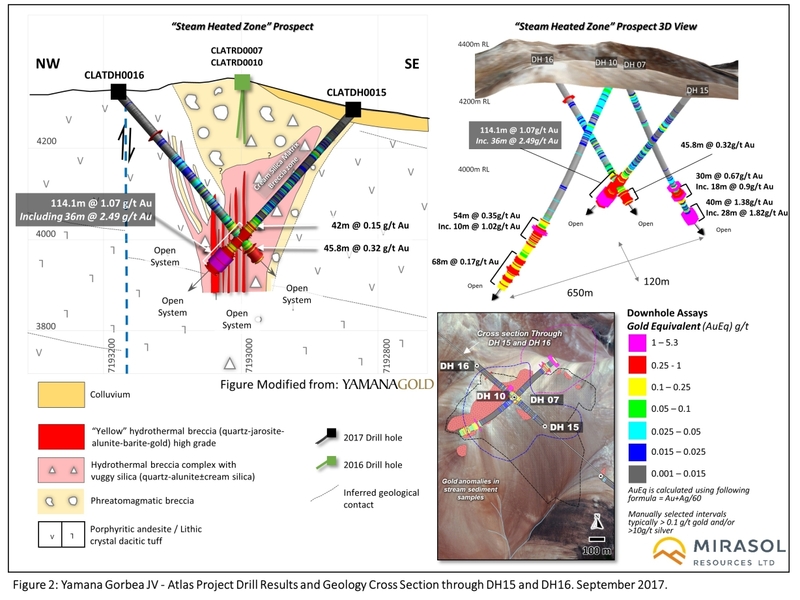 Current drill results at Gorbea include the best down-hole intersection to date from the Atlas project, comprising 1.07 g/t Au intersected over 114 m, including 2.49 g/t Au over 36 m in oxidized high sulphidation epithermal (HSE) vuggy silica breccia. Drilling to-date at Atlas (Figure 1) has outlined Au mineralization (the “Steam Heated Zone”) in an area of 650 m by 125 m by over a 200 m vertical interval (Figure 2). The Steam Heated Zone may represent a body of Au+Ag mineralization that as defined to date is open to depth and laterally in all directions outside the area of current drilling. As currently known, the top of mineralization is located between approximately 255 to 310 m depth beneath altered cap rocks, which is a characteristic in-common with other recent, HSE gold discoveries elsewhere on this same mineral belt in Chile. Further drilling is required at Atlas to determine the size, continuity and grade of the Steam Heated Zone and to establish if extensions of this mineralization occur closer to surface, where it may be accessible via open pit mining. 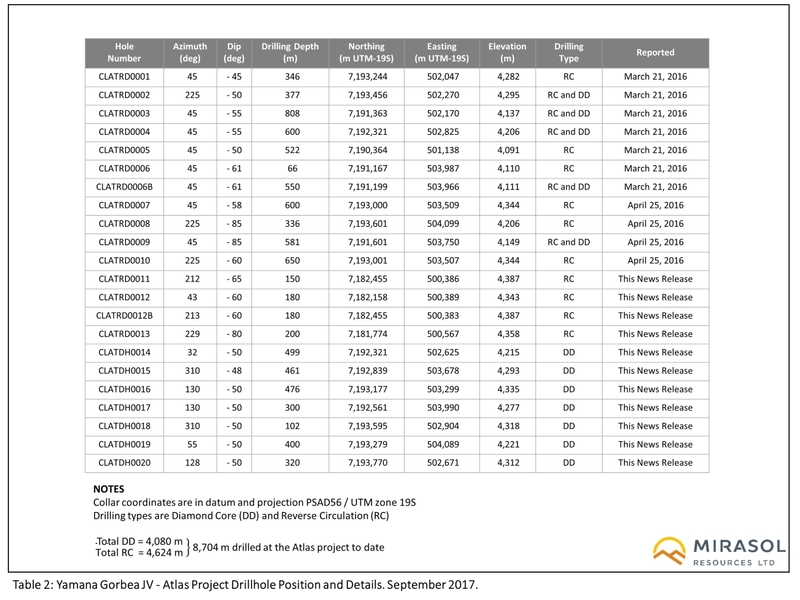 During the last drill season (October 2016 to April 2017), Yamana completed 2,558 m of diamond core drilling in seven holes (Figure 1, and Table 1 and Table 2; holes CATRAD0014 to 20) at the Atlas project. Total drilling completed since inception of the Gorbea JV in May 2015 is over 8,704 m, and Yamana’s total exploration spend to May 2017 is approximately US$5.2M, against the US$10 M required to trigger the 51% earn-in milestone over a maximum of 4 years. In addition, on May 12, 2017 Yamana made a US$400,000 option payment to Mirasol Resources to continue the JV into its third year (see news release May 30, 2017). Yamana also recently advised Mirasol that it has increased its 2017 Gorbea JV exploration budget by an additional US$700,000. The additional exploration funds will be directed to drilling at the Atlas Steam Heated Zone and other new targets at the project. Yamana is planning to re-commence drilling at Atlas for the southern hemisphere 2017 spring field season in October. Last season’s (October 2016 to April 2017) drill campaign at Atlas was focused on a series of outcropping breccia bodies that were highlighted during a pre-drill geological mapping campaign. The intersection in hole 15 starts from 347 m down hole. Hole 16 is interpreted to have drilled across the top of this same breccia body. Drill holes 15 and 16 were drilled toward each other (“scissor holes”) from the NW and SE to cross each other at depth, testing a zone beneath an area of coincident outcropping breccia, weakly anomalous soil geochemistry and a geophysical anomaly that lies midway between drill holes 7 and 10 from last season’s drilling. Holes 7 and 10 returned the best results from the 2015-16 drill campaign including 40 m at 1.38 g/t Au, with 28 m at 1.82 g/t Au. The mineralization at Atlas is interpreted to be oxidized to depths of more than 400 m downhole. Deep oxidation is considered a positive feature at Atlas as it may suggest the potential for favourable metallurgical characteristics of the mineralization at the project. The geometric relationship of mineralization intersected in drill holes 7, 10, 15, and 16 (Figure 2) outlines a target zone with dimensions of 650 m by 125 m by over a 200 m vertical interval, potentially representing a body of Au+Ag mineralization that is open to depth and open in all directions surrounding these holes. The top of the mineralization in hole 15 lies approximately 255 to 310 m below surface from the RL of the drill collar or the hill top, respectively. However, the geometry of the surface soil anomaly, distribution of un-explained stream sediment gold anomalies and alteration, suggest the target zone may extent to the south where topography is more favourable, highlighting the possibility for mineralization to occur closer to surface in this area. Gold and silver mineralization in holes 15 and 16 is hosted in a multiphase breccia body (Figure 3) characterized by intense quartz-alunite+/- jarosite alteration with vuggy silica breccia clasts and a phase of late-stage translucent barite hosting visible gold. This style of mineralization is typical of HSE Au+Ag deposits elsewhere in the same belt of mineralization in Chile (click here for information on these deposits). 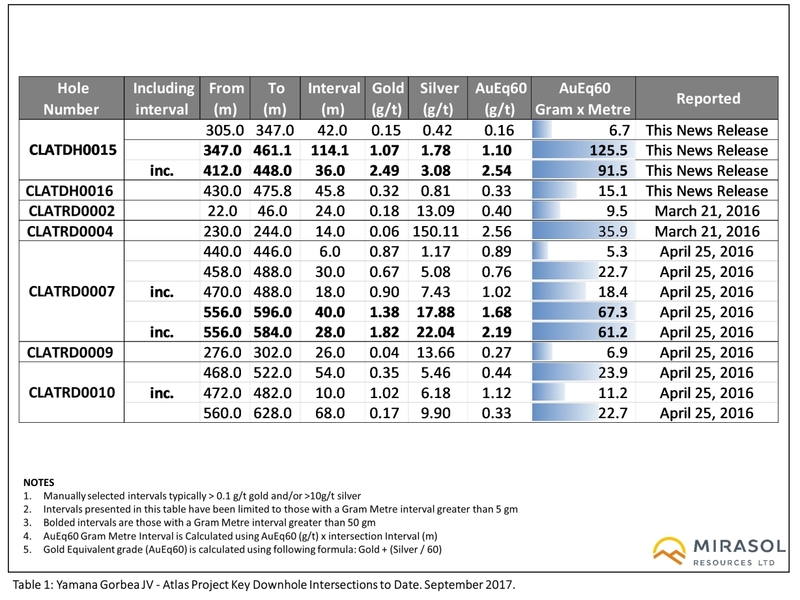 These deposits including the recent multi-million ounce gold discoveries by Barrick Gold at Alturas (6.8 M ounce resource at 1.00 g/t Au) and Gold Fields at Salares Norte (3.8 M ounce resource at 3.6 g/t Au and 43.8 M oz Ag at 53.1 g/t Ag) located 70 km due south of the Atlas project. At these projects gold is hosted in breccia bodies and the vuggy silica altered wall rocks and was discovered by drilling through thick geochemically barren alteration caps as seen at the Atlas project. Anomalous Au-Ag epithermal path finder elements and changes in alteration mineral chemistry were also detected in a separate breccia body intercepted in hole 20 at Atlas. Based on knowledge gained from modelling of results from the Steam Heated Zone, the results from hole 20 suggest that further drilling is warranted in this area to test for higher grade Au-Ag mineralization. 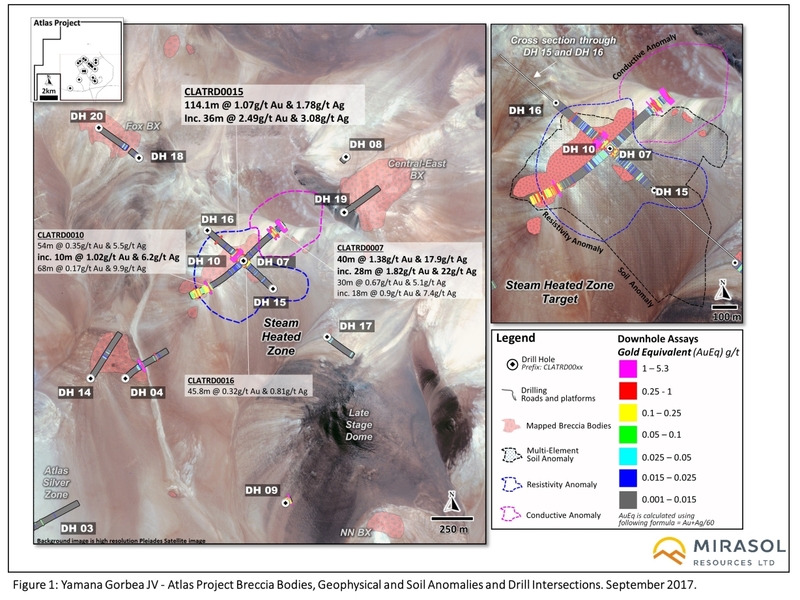 Information gathered from this season’s exploration indicates that the mineralization at Atlas is hosted in a cluster of phreatomagmatic and hydrothermal breccia bodies that when combined outline a larger breccia complex. Preliminary geological models show mineralization identified at Atlas is hosted in both the breccia bodies and in stratabound zones of vuggy silica developed in the wall rock adjoining the breccia. This association of mineralization styles is seen at a number of other large HSE Au+Ag deposits in the Mio-Pliocene age mineral belt that hosts the Atlas mineralization. Mirasol invites investors to follow the Gorbea – Yamana JV story by visiting www.mirasolresources.com and signing up to receive our new releases. Yamana applies industry standard exploration methodologies and techniques. All geochemical rock and drill samples are collected under the supervision of Yamana’s geologists in accordance with industry practice. Geochemical assays are obtained and reported under a quality assurance and quality control (QA/QC) program. Samples are dispatched to an ISO 9001:2000-accredited laboratory in Chile for analysis. Assay results from drill core samples may be higher, lower or similar to results obtained from surface samples due to surficial oxidation and enrichment processes or due to natural geological grade variations in the primary mineralization. Barrick Gold Corporation. (2016). Annual Report 2016. Gold Fields. (2016). The Gold Fields Mineral Resource and Mineral Reserve Supplement to the Integrated Annual Report 2016.